It sounds like it could be a classic Hollywood action film – a plane crashes in a dense jungle in New Guinea and the few survivors aboard must deal with a variety of life-threatening problems, the least of which includes the cannibalistic natives that are all around them. The crazy thing is that what could pass for an entertaining summer movie actually did happen and the events are recounted in Mitchell Zuckoff’s new book Lost in Shangri-La. During World War II, the United States established a military base in New Guinea. 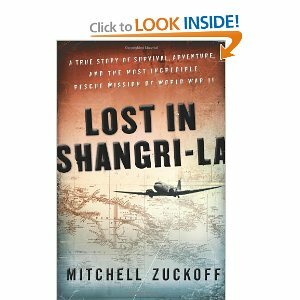 On one fateful day, a group of military men and women decide to take a sightseeing trip to an obscure part of the island, dubbed “Shangri-La.” When the plane crashes, only three members of the team manage to survive – a lively WAC (Women’s Army Corps), a young lieutenant who lost his twin brother in the crash and takes command of the trio, and a sergeant with a massive head injury. The group has no food (relying on Charms hard candy), little water, no way to contact their military base, and the knowledge that the local Dani tribe are quite violent and unpredictable. The rest of the book is about their survival and the courageous efforts that the military takes to rescue them, including dropping in a group of paratroopers and a dangerous plane rescue. This amazing story of courage and daring feats of bravery will ultimately inspire and thrill anyone (even non-fiction fans).